The Sino-American team assembled by Richard Tedford and Qiu Zhanxiang in the late 1980s launched a comprehensive investigation of the deposits near the town of Yushe, Shanxi Province, especially the local Yuncu and Yushe subbasins. Qiu Zhanxiang (1987) had worked out the local lithostratigraphic sequence, which we measured and sampled for its paleomagnetic zonation (Tedford et al. 1991). Yushe is the site of classic studies of the late Cenozoic faunas of East Asia. Teilhard de Chardin and Trassaert (1937) recognized three zones, which we were able to correlate to the observed succession (Figure 2). Zone I corresponds to our late Miocene Mahui Formation. 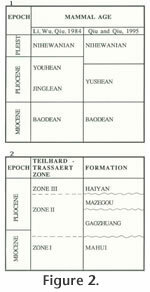 Much of the Yushe sequence is Zone II, early to mid-Pliocene, and we recognized two units, the Gaozhuang and Mazegou formations. These Pliocene units and their faunas were employed by Qiu and Qiu (1995) to typify the Yushean Mammal Age, which supplants the Jinglean-Youhean usage of Li et al. (1984). Zone III corresponds to a thin fluvio-lacustrine unit, the Haiyan Formation, reversely magnetized and considered pre-Olduvai Matuyama. It is correlated as early Nihewanian Mammal Age. As part of the loess plateau, Yushe contains overlying red and yellow loess, the oldest units of which probably date to about 1 Ma. The Mahui Formation produces no microtines. Rep was keenly interested in Microtoscoptes Schaub (1934), known from abundant material from Ertemte, Inner Mongolia (Fahlbusch 1987). This genus does not occur in Yushe, but Yushe sediments equivalent in age to Ertemte would be uppermost Mahui or lower Gaozhuang Fm. Germanomys, a later prometheomyine relative of Microtoscoptes, does occur higher in the Gaozhuang and Mazegou formations. The oldest Yushe Mimomys is from upper levels of the Gaozhuang Fm., which Flynn et al. (1997) placed in excess of 4 Ma. The material is indeterminate, but with low dentine tracts. The Mazegou Formation, in the range of about 3.4 to 2.9 Ma produces a nice sample of Mimomys. The best locality, toward the older part of the range, is YS5, found by Richard Tedford. In consultation with Zheng Shaohua, Rep and I studied a suite of jaws from YS5 and developed the opinion that it represents Mimomys (Cromeromys) irtyshensis, the type species of the subgenus. It differs from C. gansunicus in having considerably less cement. It is not a member of the subgenus Mimomys and lacks evidence of an islet or primitive "Mimomys Kante". The Haiyan Formation produces a distinctive mammal fauna. For the microtines, it contains derived species, abundant Cromeromys gansunicus and Borsodia chinensis3. Thus our field work determined the likely stratigraphic origin of the F:AM Cromeromys gansunicus specimen. It probably came from young, late Pliocene, or possibly early Pleistocene deposits in Yushe Basin, likely not from the same time range as that producing the F:AM Mimomys orientalis. Our conclusion is based on different matrix and preservation in the fossils. The overlying loess is a possible source for some of the old collections attributed to Nan Zhuang Gou, but the only microtine we found in the older loess was referable to the extant genus Microtus, probably identifiable as the Gongwanglingian M. brandtioides. Where would Mimomys orientalis have occurred in Yushe Basin? Unfortunately, this species has not been recovered in modern collections from Yushe. M. orientalis represents a different clade than the Cromeromys lineage. Zheng and Li (1986) postulated that M. orientalis is a member of the Youhean Mammal Age, which would correlate with uppermost levels of the Mazegou Fm., ca. 3 Ma. That hypothesis is consistent with the provenance data for the old Yushe specimens they referred to M. orientalis: one is from the Zhaozhuang area, which is Mazegou Fm., and one is attributed to Haiyan (which is up section, but near Zhaozhuang). Zheng and Cai (1991) confirmed this conclusion by noting that M. orientalis occurs at Daodi with the derived myospalacine Mesosiphneus paratingi, an upper Mazegou Fm. element. 3 Kormos (1934) named Mimomys chinensis for material from a locality in Hebei Province. This species is derived and has been referred to Villanyia (for example, Zheng and Li 1990). However, Rep followed current European workers who see Villanyia as endemic to Europe and utilized Borsodia as the appropriate generic name.